Anthony J. Mazzarelli, MD, JD, Co-President, Cooper University Health Care signs agreement with Brig. Gen. Telita Crosland, commanding general, Regional Health Command-Atlantic; and Kevin O’Dowd, JD, Co-President Cooper University Health Care. The program is the result of a 2017 Congressional mandate aimed at advancing the Military Health System trauma readiness for deployment to combat zones around the globe by partnering with high-volume civilian trauma centers to gain critical teamwork and technical trauma skills. As the flagship site, Cooper will help develop the program that will expand to additional sites throughout the U.S. over the next two years. A second trauma center in Oregon has been selected and will begin providing this training. 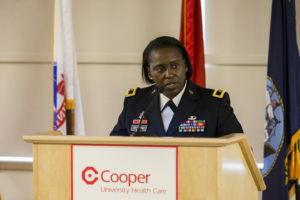 Brigadier General Telita Crosland, commanding general, Regional Health Command-Atlantic, speaks to guests and visitors about the new training program at Cooper and what it means for our military. Under the program, a U.S. Army Surgeon, emergency medicine physician, a nurse anesthetist, an intensive care nurse and an emergency nurse are fully embedded members of the Cooper clinical staff for three years to obtain first-hand training at Cooper’s high-volume, high-acuity trauma center. In addition, the program also includes clinical rotations with Cooper’s Trauma ICU, Psychiatry, Emergency Department, Labor & Delivery, Operating Room, Anesthesia, Pediatric Emergency Department, Orthopaedic Trauma, Family Medicine, Infectious Diseases, and Cooper’s EMS which serves the city of Camden. Special Operations Combat Medic (SOCM) Training Program — Cooper is one of only five hospitals nationally that provides training to Special Operations Combat Medics (SOCM) from the U.S. Military’s Special Operations Command (SOCOM) which includes Army and Navy enlisted service members who hold, or are designated for assignment to a special-operations medical position. 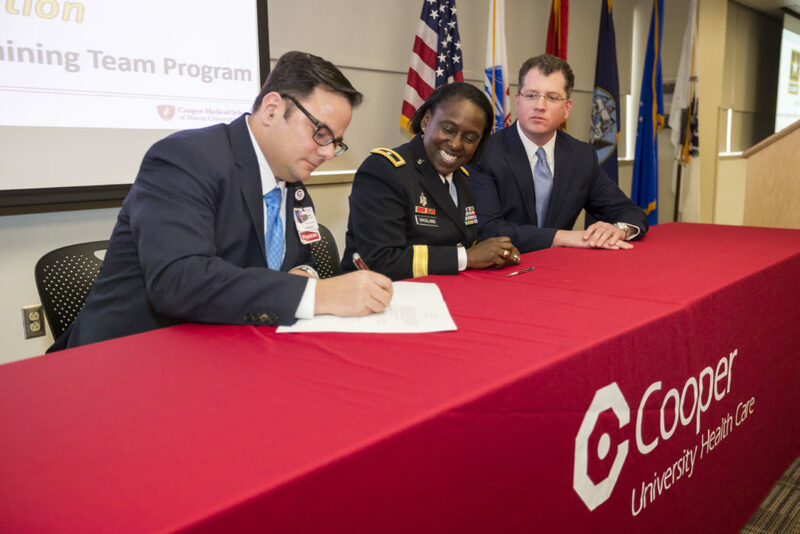 Military Trauma Readiness Program (MTRP) — A unique collaborative agreement between multiple Department of Defense units and Cooper to help military medical personnel maintain their trauma, emergency medicine, and critical care skill by being immersed in an intense clinical setting. S. State Department Guardian Emergency Management Specialist — A program for physicians, physician assistants, paramedics and civil service employees with dual roles as regional contingency planners and direct medical support teams from the Office of Mobile Security Deployments or the Secretary of State’s Protective Detail. These very experienced health care providers come to Cooper for trauma skills sustainment training. Cooper Advanced Trauma Training Course (CATTC) — An intense medical training program that concentrates on the development and honing of critical trauma resuscitation and surgical skills for physicians, physician assistants, nurse practitioners, nurses and military non-commissioned officers with a practice working knowledge of dealing with severely injured patients in any environment (combat, mass shootings, severe non-combat injuries, etc.). CATTC encourages the transfer of knowledge between military and the civilian trauma/medical community. Cooper also has wide range of programs geared toward expanding health care access to active military, veterans, family members, and first responders. Services include: the award-winning HeroCare Connect program, a joint venture between Cooper and Deborah Heart and Lung Center, which provides personal, one-stop resource that links military families, active duty and retired military, and veterans with specialty care services close to home and on a timely basis; and Helping Our Heroes, a program to provide screening and health education to first-responders in conjunction with Camden County Board of Freeholders. Click here to watch our broadcast, recorded live on Friday, January 18, 2019.